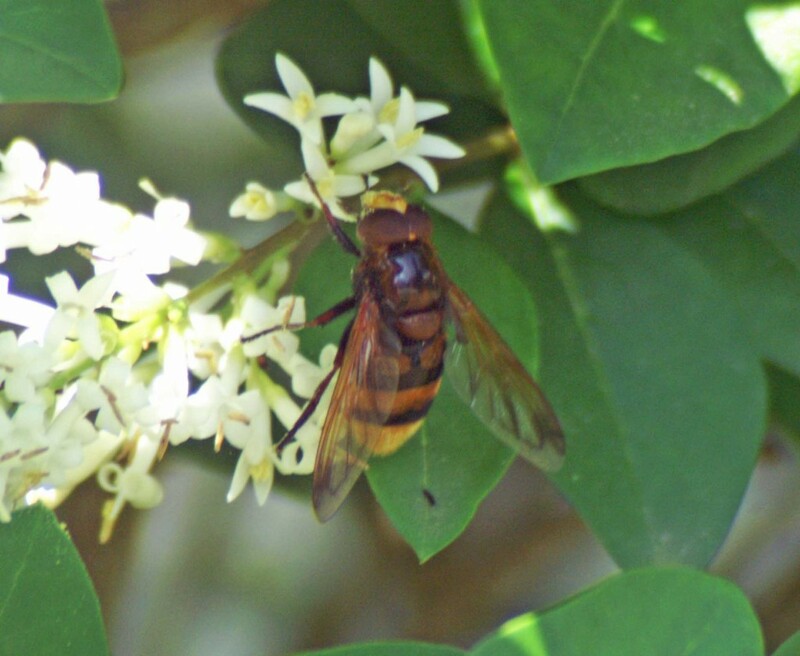 Sunny mornings and the privet in full flower attracted some interesting insects to the garden this week. I am a big fan of bees, wasps and hoverflies: most are very attractive insects and even the bigger ones pose little or no threat to people. 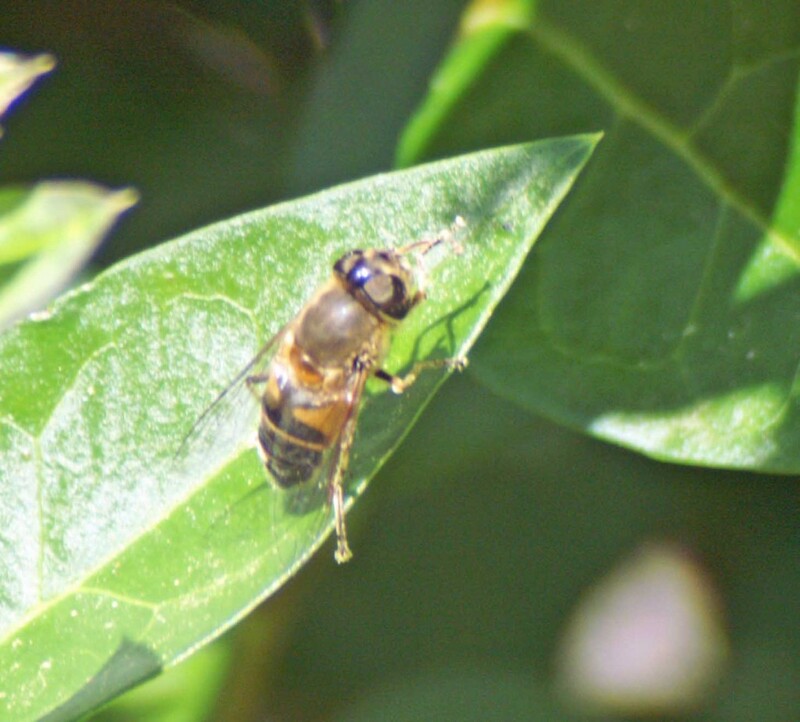 Many species are important pollinators, wasps clean up a lot of debris and hoverfly larvae consume aphids, so they are very useful visitors to our gardens too. The first hoverfly to attract my attention this morning would have been impossible to overlook, a large colourful insect, the Belted hoverfly – Volucella zonaria was completely absorbed in its quest for nectar. 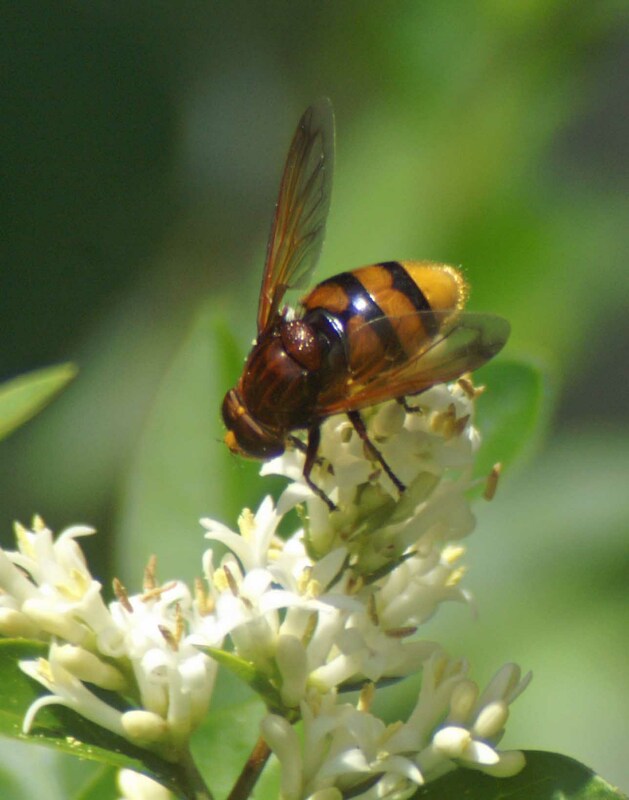 Volucella zonaria is a large, impressive hoverfly with a wingspan of up to 45mm. 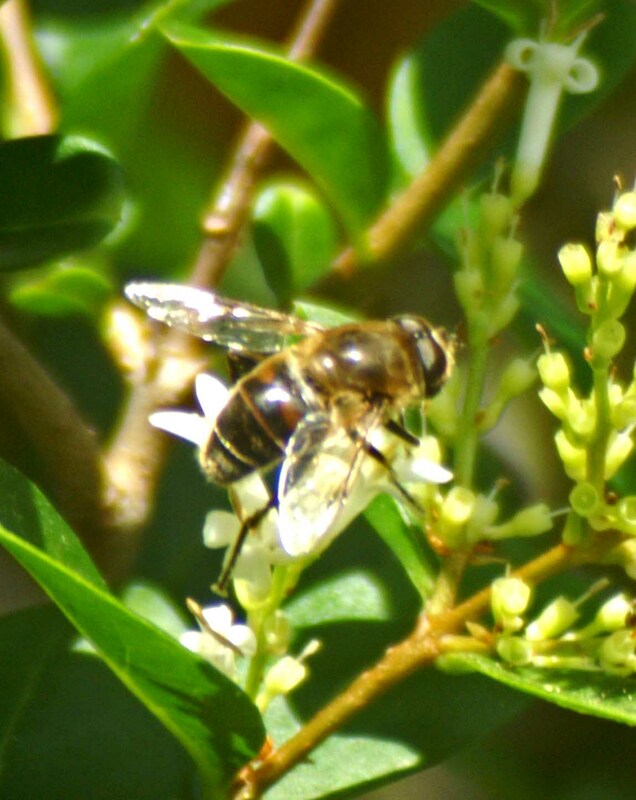 Overall effect of the insect is slightly reminiscent of to that of a hornet, although it behaves like a typical hoverfly, frequently sunbathing then darting off. 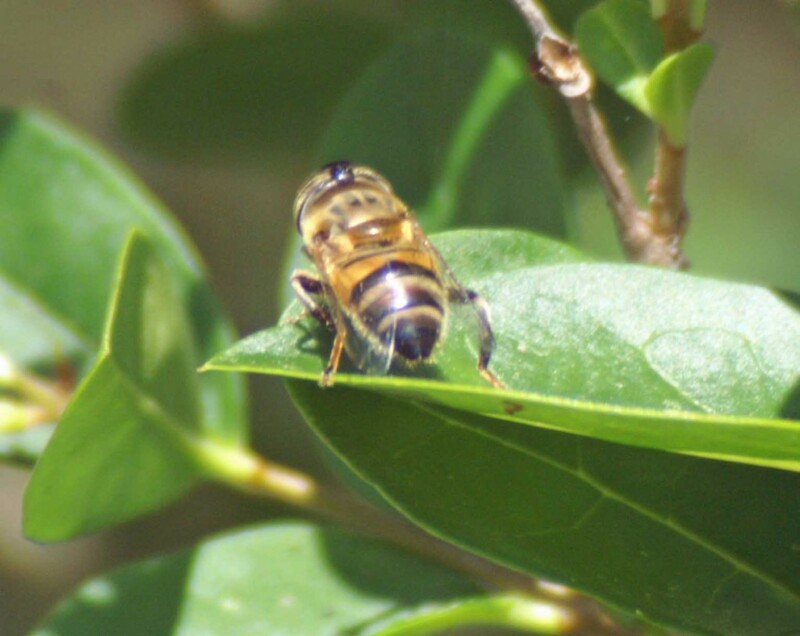 It is thought the larvae probably live in wasp’s nests. There were greater numbers of other slightly smaller, but still quite large hoverflies, recognising two different Eristalsis species. 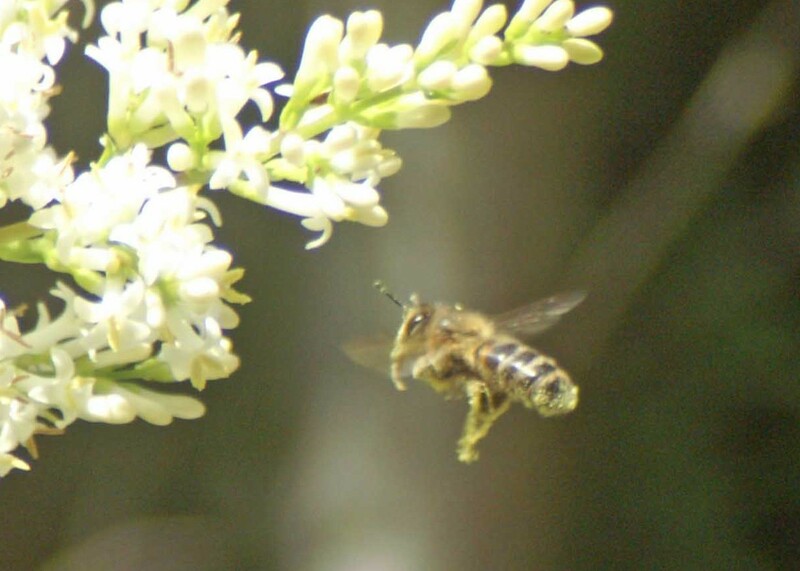 Eristalsis tenax is also known as the Drone Fly referring to its mimicry of a male honey bee. 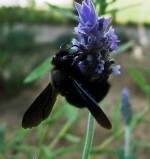 It is a common and familiar species with a wingspan of 24-28mm. A rather hairy insect, highly variable in its appearance, but basically deep brown with 2 quite narrow, whitish rings, and greater or lesser amounts of orange on the edges of the abdomen. 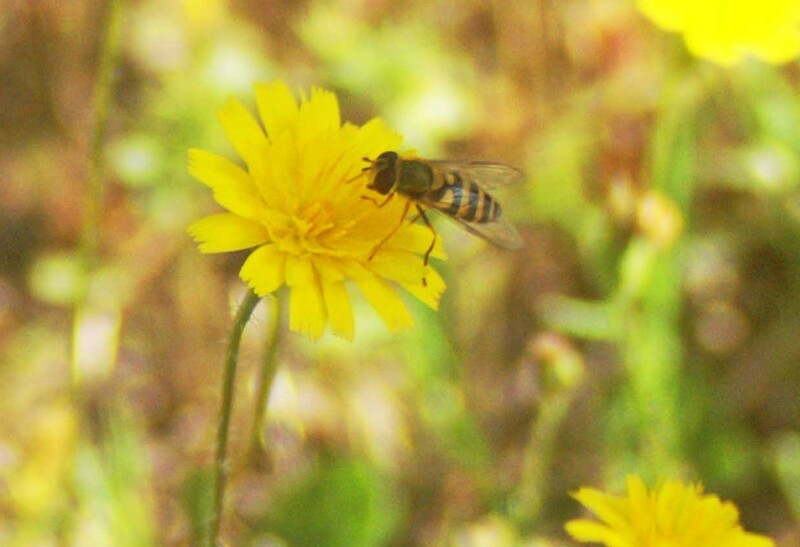 It occurs in a wide variety of habitats, almost anywhere there are flowers. 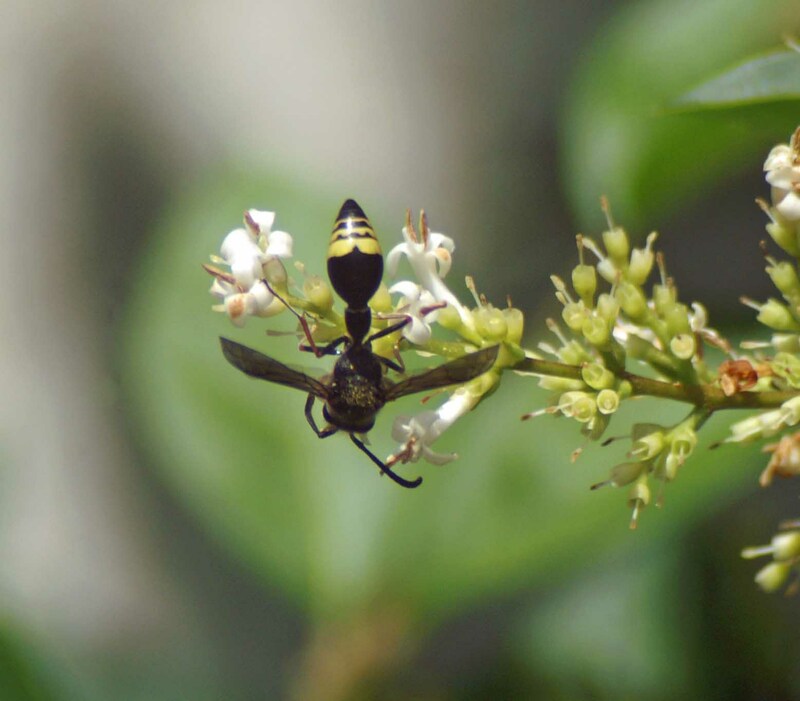 Eristalsis pertinax is rather similar to the Drone Fly, but slightly more slender and with a strongly tapering abdomen that has one pair of broad yellow-orange markings. The front legs are wholly orange. There were a few smaller hoverflies around too, some were familiar, but there were others I have so far been unable to identify. Syrphus ribesii is a common and fairly typical hoverfly with a wingspan of 20-24mm. 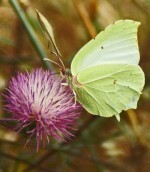 It is found in most flowery habitats such as rough grassland, hedgerows and gardens. Metasyrphus corollae is even smaller, with a wingspan of just 16-18mm. This is a very widespread and common insect found in similar habitats to the above. I was watching Ilex Hairstreak butterflies nectaring on the thyme flowers and was distracted from them by a large dark-winged insect that was also interested in the nectar. More used to seeing them on the ground, it took a minute to realise it was a Sand Wasp. It kept retreating to the stone in the photograph, then running back to the flowers, scrambling through them rapidly, while constantly flicking its wings. It was joined by another, showing no aggression towards it. I thought they were perhaps hunting for caterpillars for their nests, but I didn’t see them find any. 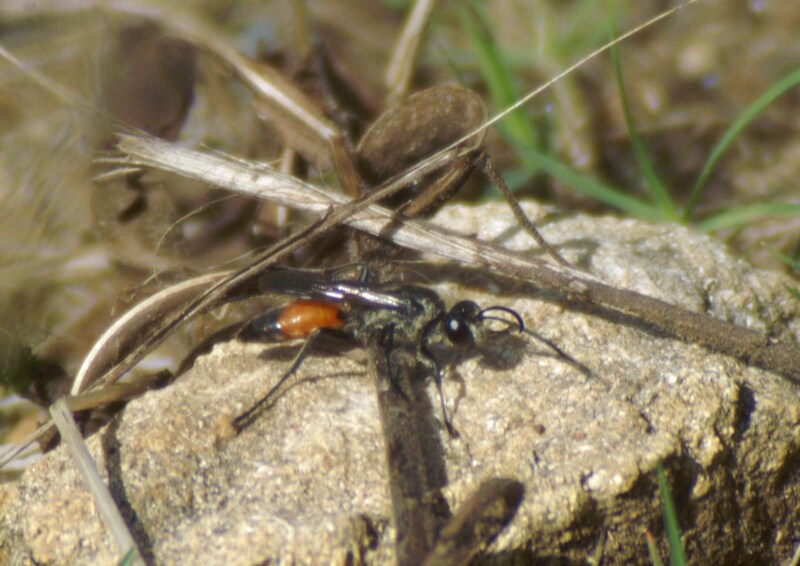 Sand Wasp – Ammophila sabulosa: a very distinctive large species, with a body length of 20-24 mm. The females catch caterpillars, dragging them back to pre-dug nests. They stock each nest with a single large caterpillar and lay an egg on it before covering it over. Over the next few days I began to see Sand Wasps all around the garden, the one below was on the ground scurrying around some flowerpots when I disturbed it and it flew across to a rosemary shrub, staying very still as though trying to hide. I saw them scouring the lantana and the thyme often, always in a big hurry and with wings almost constantly flickering impatiently. I watched one disappear under a fallen palm frond from which it did not re-emerge so I assumed it had dug itself into the ground there. I have yet to see one with a captive caterpillar. 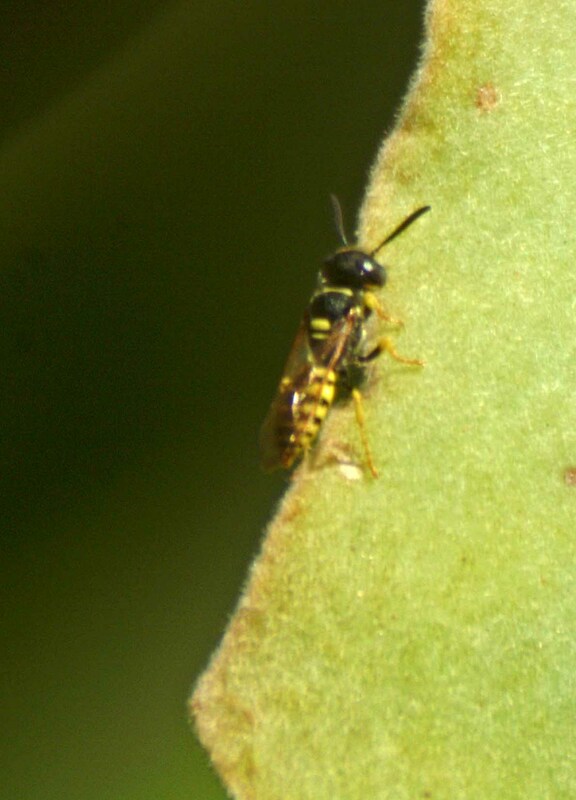 The following wasp is another I’ve spent quite a bit of time trying to identify without absolute success yet. 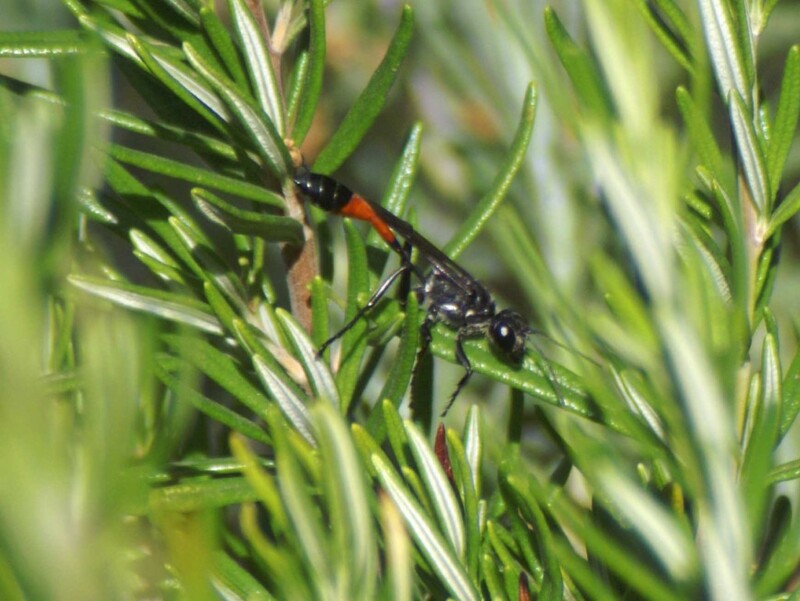 I think it may well be wasp of the family Eumenidae, which includes potter and digger species. * I am not overly-familiar with a lot of the insects from these species myself and am trying to identify them as I come across them, but I am not going to claim that I’m right in my conclusions, so as always, I am pleased to be corrected. 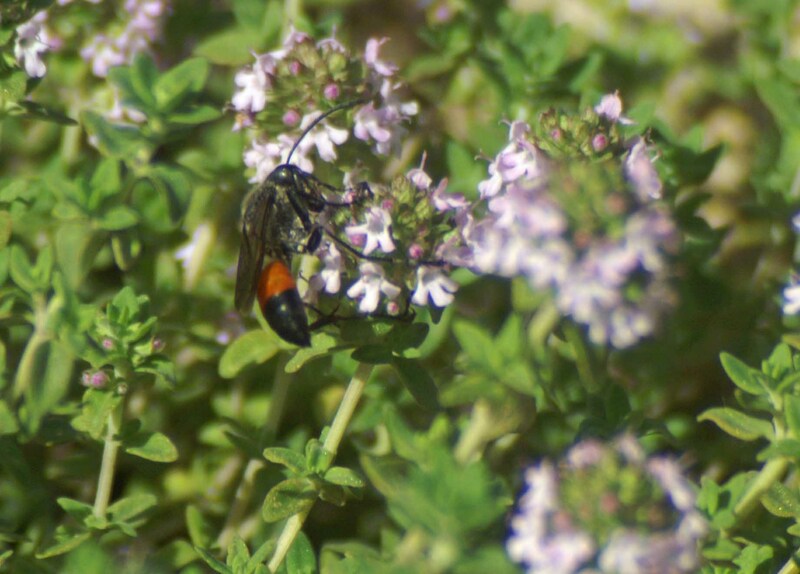 This entry was posted in Hoverflies of Southern Spain, Insects of Southern Spain, Nature, Nature Photography and tagged ammophila sabulosa, Belted hoverfly, Drone fly, eristalsis pertinax, eristalsis tenax, privet blossom, Sand wasp, volucella zonaria. Bookmark the permalink.